Today’s lesson focused on southern society before the civil war. I emphasized that in order to understand the causes of the Civil War, we have to first understand what was going on in the United States during the antebellum era. The antebellum era is the time from the signing of the Constitution until the start of the Civil War. I began the lesson by writing a simple word problem on the board. It went something like: Seven cats were collected from three local towns, Clarendon Hills, Hinsdale, and Oakbrook Terrace. Neither of the towns had populations exceeding 18,000. In October, when the animals were caught by local residents, they weighed 7 lbs. each. How much did the cats weigh all together? My point was just to introduce, in a fun way, the idea of red herrings, and that we don’t want to be led “astray” considering, highlighting, or writing down, facts which are not relevant to the topic in question. So, the lesson was introduced. The topic and activity was to use a single source, and to collect facts about southern society during the antebellum era. Each received a paragraph or two about one aspect of southern society. The students read quietly, and were to highlight only those keywords which were directly on topic. 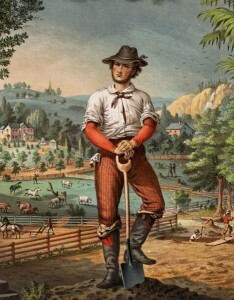 Romantic Image of the Yoeman Farmer. The text I originally found and used was about southern society and included information about various groups. This website has now been taken down, so I can’t link you, unfortunately. Instead, I can link to this page. (I had 15 students in class, so I divided up the article into sections, and brought 2 -3 sets of each section.) In addition, conduct a Google image search using the following keywords: “yeoman slaves pyramid”. You should be able to find plenty of images showing how society was divided at this time. After giving the students time to highlight keywords on their handout, they offered up their findings to me one by one. Using the dry erase board, I wrote down their information (in keyword form) as it was provided, and we discussed and clarified points along the way. After all of the keywords were collected on the board, I drew the pyramid as it is pictured online (see the pdf below). And, as a group, we sorted our keywords into the appropriate sections of the pyramid. I also handed out a subdivided pyramid, printed on paper cut to the exact size of the History Portfolio text box, and the students filled in their forms for their Portfolios. Here is that pyramid handout for your students to use.